The sharp comedy and the bittersweet romantic drama is great but, on the real, the fashion in the 2015 Archie comics has been the best stuff in the publisher’s reboot. Presenting a sense of style—or anti-style—to the world is 96.3% of what it means to be a teenager. Kids in the puberty zone put undue amounts of thought into the trends they deny, make fun of or embrace. These are the things that they (and lots of adults) think stand in for a personality or a worldview. The creators of the new Archie and Jughead books get that and the proof is on every page. Just about every panel in the relaunched Archie books sports some small sartorial detail that’s impressive for its observational power. 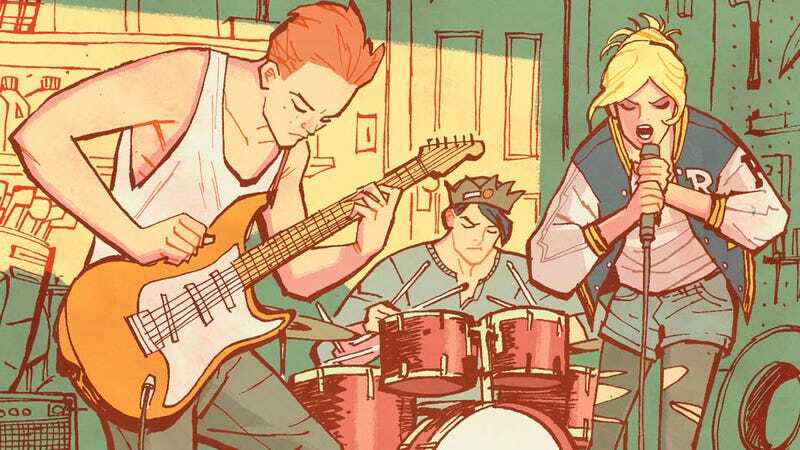 Take this panel from Archie #2. See the way that the line of Archie’s pants break and bunch at his ankles? That’s an actual thing that happens in real life when you wear work boots. Instances like those show that the artists who’ve been drawing the great Archie reboot comics understand how fabric drapes, bunches and slides across the body. Flip through the pages and you’ll see other little touches that make the characters feel much more real: frayed fabric on the armhole of a denim vest, how trouser waistlines scooch down your hips when you sit or move, or the way that velvet/sueded cotton reflects light differently. You can almost feel the texture of the pants that Betty’s wearing in the panel below. Veronica, Reggie, Moose and Trevor aren’t superheroes who wear costumes made of magic spandex or unstable molecules. Making the teens of Riverdale feel tangible require the suspension of a different kind of disbelief. So far, Fiona Staples, Ericka Henderson and the artists on the book’s best variant covers have all been cranking out top-shelf renderings of modern-day fashion trends. Translating the look of a real-life young person onto the comics page require a different kind of draftsmanship, one honed by drawing from real life. The drawing in the new Archie comics make me want to go shopping. I even kind of want to see if I can pull off Jughead’s crown. If you ever see a picture of me wearing one, you’ll know why.